Carts vs Bags - Which Do You Prefer? The founding fathers of disc golf didn’t have much of the incredible gear that players have access to nowadays. From comfortable bags to easy-to-use carts, nearly anyone that hits the course has the freedom to choose what works best for them. But is there a distinct advantage that a cart provides over a bag or vice versa? How does carrying your discs compare to rolling them? Today let’s break down the pros and cons of using carts and bags, and how a new player might want to view their gear. When Are Bags The Right Choice? 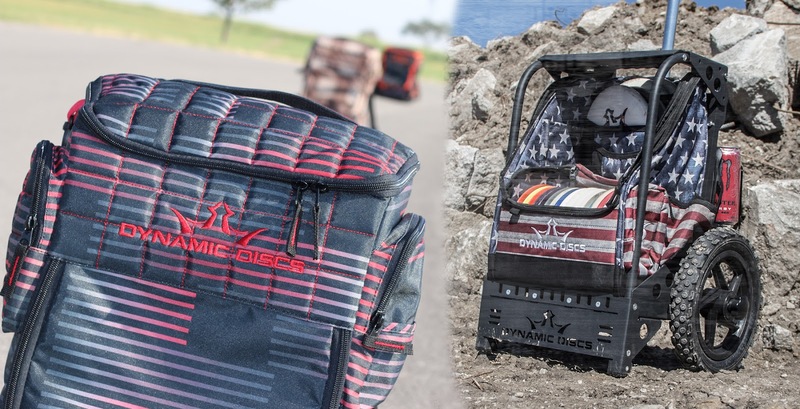 Often viewed as the tried and true method for taking your discs out to the course, a bag offers the comfort and convenience that many players are used to. Years ago, bags were more rectangularly shaped with one strap for your shoulder, but manufacturers have come a long way since then. Now, the most popular option is the backpack style bag, with two straps that balance the bag’s weight more evenly across your shoulders and back. Not only are bags a pretty comfortable option, but they also offer the ability to be hands-free as you walk along the course. Keep a cool drink in your hand and your scorecard in the other, all while your discs are taking a ride on your body. There’s also a fairly low barrier to entry when it comes to bags, as you can purchase a high-quality backpack style like the DD Trooper Bag for under $40. Those who want to splurge a bit more can spend upwards of $200 for something like the DD Ranger H2O. If you ever hear a complaint about a disc golf bag, it’s that by the end of a round or two your back starts to hurt. Truth be told - even the most comfortable bags out there can’t compensate for the fact that you’re carrying the weight of a small child’s worth of discs. Plus, accessibility can be frustrating for some, as you have to take your bag off each and every time you need a disc. New players might be wise to invest a small amount of money in a backpack style bag to see if it’s something they like before shelling out the big bucks. Despite the advancements in bag craftsmanship over the years, you’ll find some disc golfers who are cart fans to the bitter end. Whether you play in hot temperatures and want to save your energy for your game or you simply don’t want the weight of your discs on your back, a cart is a smart way to go. Practice rounds, tournament play, and even field work can all become a bit easier when you utilize a cart, which is essentially a metal housing for your bag with rugged all-terrain wheels and a handle. 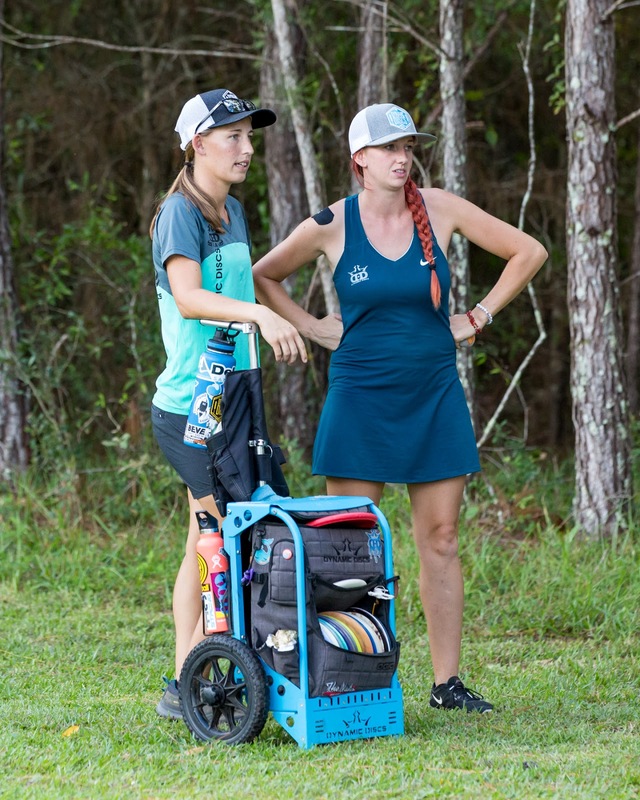 Competitive players, like Dynamic Discs Team Member Paige Pierce, rely on using a cart to enhance their performance on the course, attributing their success to their increased energy. While a cart is certainly a great option, it does come with some drawbacks. Some courses with rough terrain and a lot of foliage might inhibit your use of a cart, as it’s harder to bring it right alongside you. A tricky lie means leaving your cart on the fairway while you trek through the shrubbery. Especially rocky or steep ground can also cause some issues for carts despite their durable wheels. Cost can be a prohibiting factor too, as you not only need to purchase a bag for your discs but also the cart itself. Although a high-quality DD Cart by ZUCA is priced affordably at $195, you’re still paying for two sets of premium gear. Those who are new to the sport should plan on investing in a cart later down the line unless their physical ability would greatly benefit from the use of one right off the bat. We’d love to know what you prefer - do carts make more sense when you’re playing a tournament, or are bags the way to go at all times? Let us know in the comments below! I have been considering this combination myself. I think it would be a solid working pair. Now older and post injuries, cart. I've always carried bags but now that I have a cart I'm very happy with it. Very mobile and the fact that I don't bend over to pick up my bag 30+ times a round is the biggest positive. I've used my backpack cart on flat courses and even mountainous courses without any issues! I like the backpack cart because I do have an option to carry my bag if I feel the terrain will be too demanding for the cart, but I haven't found that terrain yet! Both! I use my Ranger for casual and training rounds and the Züca DG-Cart for tournaments and looong DG-days. As an older player its not so much the problem with weight on the back but weight on the knees. The cart has allowed me to play longer with less pain. Carts can also be configured to carry extra items like waters and extra disc. As a brand new player, my very first round was just after a snow melt. I completed an exhausting 145 throws. (Par 54 coarse.) This was 145 times I set down my little bag in the mud and had to pick it up again. Due the mud and my utter lack of physical fitness, I knew I had to get a cart or quit. I couldnt afford 200+ dollars on a sport I played once with 20 dollars of xout lightninv discs, so I made a cart myself with a wheel axel and an old crate.